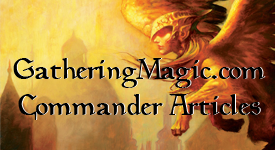 Editor’s Note: This post is going to teach you how to play EDH. It will not teach you how to play Magic: the Gathering. Basic knowledge of Magic is required to understand how EDH works. If you want to learn how to play Magic, please visit playmagic.com. You’ve heard your friends say you should build a deck. You’ve seen games of players laughing as they do something you’ve never done in your FNM matches. You’ve read articles about EDH and now, you’ve decided to take the plunge. Welcome to the best format in Magic. Welcome to Elder Dragon Highlander. This post will show you all you need to do when putting together an EDH deck and playing in this format. I’ll try and make it exciting but it’s rules people; sometimes it helps to be a little dry. Your deck consists of two parts: your library and your General. The General has to be a Legendary Creature; there is no way to skirt this issue (No planeswalkers or Genju of the Realm). The library has to be 99 cards to make the complete deck 100 cards exactly (this rule gives this blog its title). But here’s the fun/tricky part: See the mana cost on the upper right corner of your General? You can only use cards that share one or any of those colors in your deck. If a card has a mana symbol that does not match one your General’s mana cost anywhere on the card, it cannot be used in the deck. Karrthus’ mana cost is 4BRG. Only Black, Red, and/or Green cards can be put into the deck (Colorless and lands as well). Lightning Bolt can be included, but not Lightning Helix, since it is also White. Cavern Thoctar can go in the deck but Puppet Conjurer cannot (because of the Blue mana symbol in the textbox). This works for hybrid cards as well: Murderous Recap can go in but Scarscale Ritual cannot. This rule also applies to lands and artifacts; though if a card states a color or basic land without the mana symbol, then it can go in any legal deck it could fit in (See: Arid Mesa or Mirror-Sigil Sergent). If a card would generate mana that’s a different color then the General’s colors, it generates colorless mana instead. You can still use a City of Brass in the Karrthus deck to create only B/R/G mana even though it could produce all 5 colors. The other unique aspect of this format is the fact that it’s “Singleton.” Singleton or Highlander (named because of the 1986 film that proclaimed: There can only be one!) states that except for basic lands, there can only be one copy of each card with its given English name. The current banned list is found here (remember, everything but basic lands are restricted, so it’s either allowed or it’s banned). Only Vintage legal cards in addition to the banned list are allowed (i.e. no Un-Cards), but with two exceptions: cards are legal as soon as the Prerelease and Shahrazad is legal (don’t ask me why, but it is). – Each player starts out with 40 life. This is an additional state based effect. General Damage is cummulative throughout the game; nothing can reduce the amount of damage a General has previously done to a player. Because it is a property of the card and not a characteristic of the game object, a card is still the same General even if it leaves the field and returns. General Damage is specific to each General/Player pairing, not combined across all Generals. A player can lose if he or she is dealt 21 points of combat damage by his or her own General (ie: under someone else’s control). – If your General would be put into the graveyard or exiled, you may move it to the Command Zone instead. If you do so, it does not go to the graveyard and trigger such abilities (this is the opposite of tokens). If your General goes to your hand or library instead (either by Unsummon or Condemn), it does so normally. In turn order, players may exile (face down) some or all of the cards in their hand. Each player then draws one less card from their deck than the number they exiled. Players who exiled at least one card may return to step 1 and repeat the process, drawing one less card each time. Players shuffle all exiled cards into their deck. For those that aren’t familiar, Paris Mulligan is what you do during a tournament: shuffle your hand and draw one less (history of it here). That’s it. You’ve got the general gist of how to play EDH. Most people tend to build around their Generals (which is why we focus on them in our articles) so a good place would be to start with what Legendary Creatures you do have. It’s ok if your collection is small and you don’t have every card known in Magic; build with what you have. Experiment, take chances, make mistakes, get messy. Try a few games with your friends to see what they’ve done with their decks. If you play Karrthus for the first time this game, he costs 4BRG. If someone plays Wrath of God, you can elect to put him in the Command Zone. Most players put a counter on their General to denote that they’re been cast once. Now, to play Karrthus a second time, it costs 6BRG (4BRG + 2(1 time having already been cast)). You play Damnation and move Karrthus to the Command Zone again (and put two counters on him). Now, he costs 8BRG to cast (4BRG + (2(2 times)). If an opponent played Evacuation to return Karrthus to your hand, you can cast him for 4BRG since he’s not coming from your Command Zone. Then an opponent plays Path to Exile on him and you put him in the Command Zone with three counters on it. Guess how much it will cost to play him next time? That’s right, 10BRG. Cards like Dragonspeaker Shaman can help lower the cost for Karrthus since they affect casting the creature including the Command Zone. But cards like Dramatic Entrance and Dragon Arch can’t since the Generals aren’t in your hand. This entry was posted on Tuesday, November 17th, 2009 at 3:00 pm	and posted in EDH, Magic: the Gathering. You can follow any responses to this entry through the RSS 2.0 feed. Does the command zone count as part of your hand? Meaning that a general played from this zone can trigger any “Played from hand” abilities? No, the Command Zone is a separate Zone that is unique from the hand. It does not count as being part of the hand, or being part of the library even. It isn’t the graveyard, or even the exiled zone. It is merely a 5th zone separate from all the others, unique from them. I didn’t make it clear enough, I’m sorry. The General used to be exiled, but since Planechase introduced the Command Zone, that’s where the General sits. It’s separated from the deck face up before you start to play, where it sits in the Command Zone (like the Exiled zone, but in it’s own section). I hope that clears it up. I’m making the changes in the article. Sorry for the confusion. You can, but it’s not recommended. The Myojins won’t enter the battlefield with the Divinity Counters and Phage will lose you the game. Hakkon is the same as well since you really can’t play him from your graveyard since he’s in the Command Zone. What about generals that have one color casting cost but have other mana symbols in their rules text? Such as Rhys the Exiled. He costs 2G but has an ability B, Sacrifice an Elf: Regenerate Rhys the Exiled. Does this mean my deck can only contain G casting costs or is G and B legal? At the moment, Rhys is “banned” as a General since in his textbox there is a mana symbol that is not in his casting cost. There is a movement (and an upcoming article) to get Generals like him allowed as a General. Bosh, Daughter of Autumn and Memnarch (etc…) are in the same camp. Sorry about that. 1)Can I use more than one Legendary in the deck? Even with my general am I allowed to include other Legendary Creatures (or even Planeswalkers)? 2)What can my general do from the Command Zone? Can he attack? Use abilities? Nothing at all? Do static abilities still function? 3)When a card says “comes into play” does play refer to the Command Zone as well? 1 – Yes, you can certainly have more than one Legendary per a deck, they just can’t be the same name (and they fit with the color guidelines). 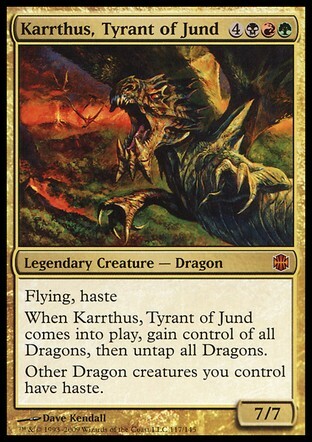 If I have Rafiq as my General, I can have any other Blue, White, and/or Green Legendary creature in my deck as well. 2/3) The General just sits there in the Command Zone until you cast him/her. The Command Zone is a zone that’s just like the Planechase planes cards that sit alongside the “exiled” zone. One you cast him/her, it operates as normal. So if a General has a “enters the battlefield” ability, it triggers when he/she enters the battlefield. Hope that clears things up a little bit. It’s easy to understand once you see it in action. What happens if you play a legend from your deck that is the same as a general – do they both die? I have heard that generals take precidence – but can’t find “official” clarification. That rule was changed. It happens just like any other Legendary Creature and they both become sacrificed. Rule #14 under Play for the “Official” rules. Say I have Uril, the Miststalker as my general. Can I pump him with auras while he is still in the command zone? No you cannot. The Command Zone is not on the Battlefield, but basically Exiled. You can’t do anything to your General from there but cast it. If Akroma, Angel of Fury is my general, can I play her morphed, if so desired? How does this interact with the additional mana costs of playing my general multiple times? A Morph is (3), so if you want to play Her again, it’s (3) + (2), so (5). Thanks, I’m assuming that means there is no particular rule about not being able to play a morphed general. You could cast your General anytime/anyway you normally could within the rules. Haakon, unless he’s in your graveyard, can’t be cast (which makes him a pretty awful General). Say rafiq of the many comes in, and I have already cast him once, can he be unsummoned? and if so, does he cost 2 more to cast from my hand? Yes, he can be Unsummoned like any other creature. You can recast him from your hand for his regular cost because you cast him from your hand and not the Command Zone. If he gets killed again, he costs 4 more to play, 2 from the past time and 2 more for the last killing; going to your hand does not add any mana to his next cost. Would you mind terribly if I translate this article to spanish so you can post it here (or somewhere else) and I share it with my friends? I hope this can be done; this format seems like the nicest thing since the two headed dragon. Of course you can. You can translate anything on this blog to Spanish if you want. Sorry if a joke doesn’t cross the language barrier, I apologize. OKAY! I translated the rules here, and had our first games last saturday! Now I understand the fuzz, is really well founded. I will do a revision of this article which I translated and send it back to you in case you want to publish them somewhere or have a link lying around. I was just wondering if the basic snow lands from the Ice Age block were limited to 1 in EDH format. No, because they are basic lands. Have as many as you want.